Thank you so much for the non-political post! I'd like to cast my vote for the tallest of your donkeys, please. I guess we couldn't expect you to keep elephants just to stay non-partisan! ha! The donkeys just made me smile! Thanks for the post! Thank you!!! I use my blog for gardening and DIY stuff. It's my creative outlet and I'm SO tired of all the political stuff. Cute can get you elected - especially if you are a sweet donkey, dog, cat or sheep! They have the same look my dogs have when they are hoping for and expecting a treat! So cute! 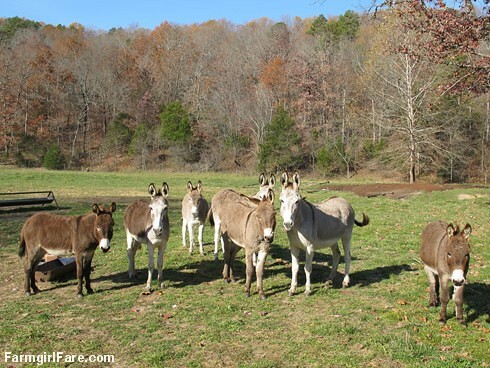 Betcha your donkeys would do a better job of running Congress than what we've got; they seem to be willing ro work together for the sake of a common goal (that being more treats)! I love this photo. Thanks. Loved your comment Lisa....Now it's time to move forward towards those treats! Thanks for all the comments. I'm so glad you got a kick (ha) out of this post!